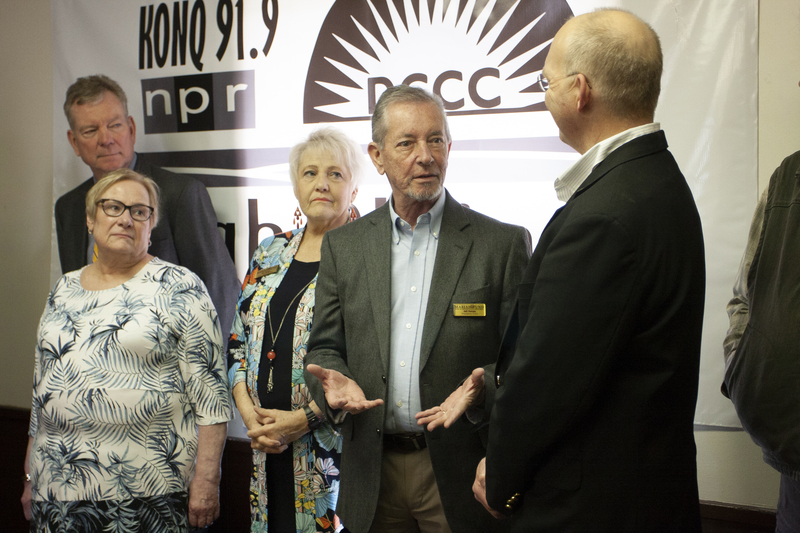 Dodge City Community College administrators and trustees, officials from the Mariah Fund, and representatives of High Plains Public Radio met Wednesday, February 10th at the KONQ studios to culminate a project long in the making. 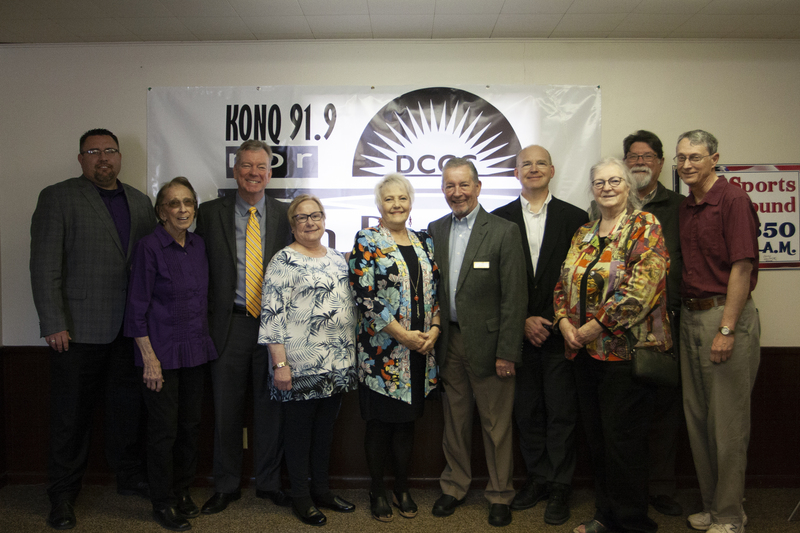 DC3 partnered with HPPR to bring NPR and other network programing to college’s 91.9 FM radio signal late last year. Mariah Fund monies paid for the satellite dish to receive network signal, as well as installation of a new translator provided by HPPR. 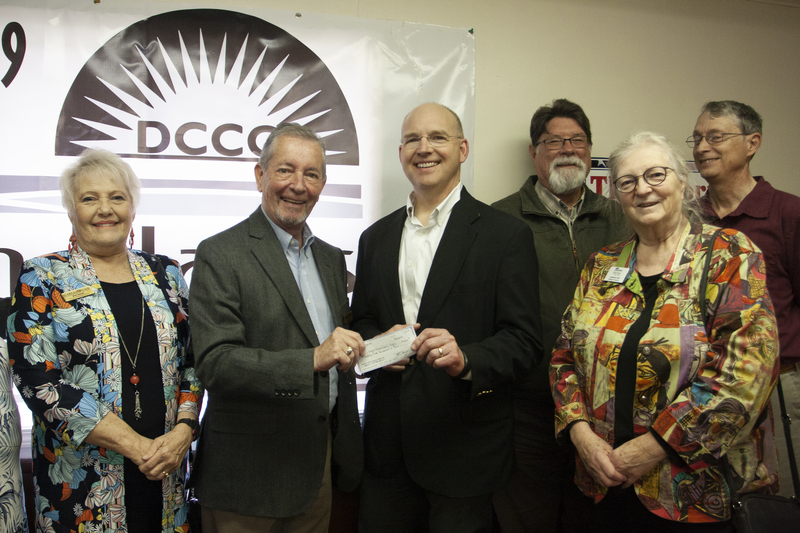 Wednesday, Mariah Fund President and CEO Jeff Thorpe was on hand to finish out the grant by presenting a check to furnish a new antenna for the station. The original KONQ antenna was in poor shape, according to Kathy Holt, Strategic Projects Coordinator for HPPR. The new antenna will improve signal clarity and give a small boost to the station’s range. Thorpe said that in addition to traditional grant activity, Mariah Fund is increasingly called on to help develop mutually beneficial partnerships. He said the partnerships produce effective outcomes and allow grant money to go further. While the Mariah Fund primarily backs tourism activities, supporting the area’s cultural heritage plays an important role in the foundation’s mission. Mia Korbelik is a DC3 trustee and has been a member of the Mariah Fund board since the foundation’s inception in 2010. She sees the large geographic footprint of HPPR as a way to unite a widely scattered population. In addition to funding the project, Holt noted that Mariah Fund representatives also helped with negotiations and mediating logistical challenges. The project has progressed in fits and starts since the Mariah Fund awarded the $25,000 grant five years ago. The presentation marks the culmination of that five-year journey. “It’s a reflection of people being committed and working out challenges,” Korbelik said. Holt touted the strength of the partnership between the three groups.